There are 152 Assisted Living Facilities in the Columbia area, with 13 in Columbia and 139 nearby. The average cost of assisted living in Columbia is $3,652 per month. This is higher than the national median of $3,346. To help you with your search, browse the 327 reviews below for assisted living facilities in Columbia. On average, consumers rate assisted living in Columbia 4.3 out of 5 stars. Better rated regions include Ellicott City with an average rating of 4.3 out of 5 stars. Caring.com has helped 6 families in Columbia find high-quality senior care. To speak with one of our Family Advisors about assisted living options and costs in Columbia, call (855) 863-8283. Columbia, ranked the number one place to live in 2016 by Money Magazine, is a city in Howard County, Maryland. It is considered part of both the Baltimore and Washington metropolitan areas and lies just 20 miles southwest of Baltimore and 24 miles southwest of Washington, D.C. Seniors make up 13.3 percent of the population and they can choose from 13 assisted living facilities (ALFs) in the city. 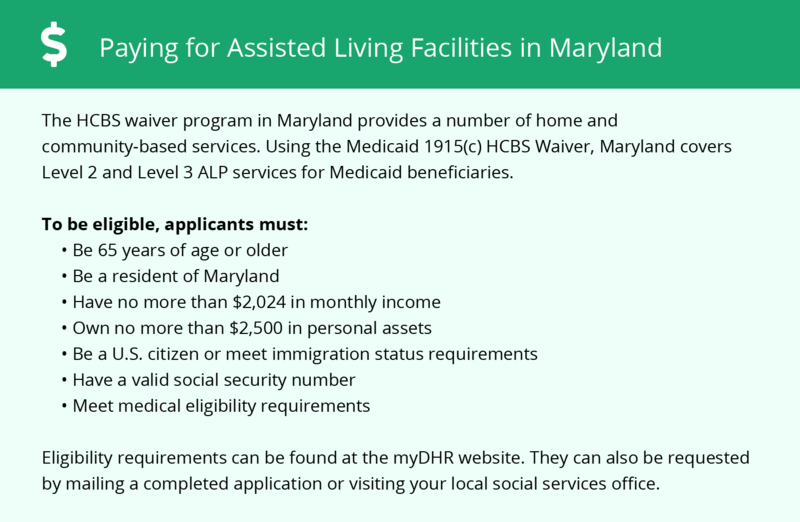 ALFs are regulated by the Maryland Department of Health and are defined as residential or facility-based programs that provide room and board and assistance with daily living activities. Columbia offers seniors a wealth of arts and culture including outdoor concerts at the Merriweather Post Pavilion, Lake Kittamaqundi, Historic Oakland Mansion and Toby’s Dinner Theatre. Seniors can also take advantage of Howard County’s Senior Pass Program, which gives free admission to arts performances and school sporting events. Columbia's climate varies from hot, humid summers with highs of 88 degrees Fahrenheit in July to cold winters with lows of 24 degrees in January. Snowfall is below average at 18 inches per year and rainfall is slightly above at 44 inches annually. The cost of living in Columbia surpasses the U.S. average by 35.1 percent. This is reflected mainly in higher housing costs but the cost of living, in general, is lower than in Washington, D.C. Grocery and health care costs come in right around U.S. averages. Violent crime and property crime in Columbia are low for the area with scores of 39.9 and 42.1 out of 100, although they are higher than national averages. Crime here is lower than both Baltimore and Washington, D.C., which is good news for seniors wishing to live in a safer area. Compared to the rest of the country, Columbia is safer than 21 percent of U.S. cities. Seniors over 60 can get around town for free on one of RTA Transit’s public buses. HT Ride provides curb-to-curb transportation for seniors. Neighbor Ride also provides supplemental transportation for adults over 60. Maryland exempts social security benefits from taxation, which may help seniors put more money towards assisted living. However, all other types of retirement income are taxed. Assisted Living costs in Columbia start around $3,652 per month on average, while the nationwide average cost of assisted living is $4,000 per month, according to the latest figures from Genworth’s Cost of Care Survey. 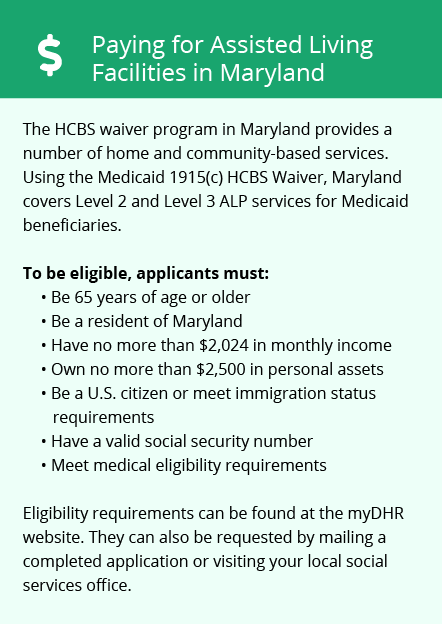 The state of Maryland offers financial aid for room and board to seniors through the Senior Assisted Group Home Subsidy Program, and there are three government programs that can help offset costs through other services: the Increased Community Services Program, the Community Options (CO) Waiver and the Community First Choice Program. To see a list of free assisted living resources in Columbia, please visit our Assisted Living in Maryland page. Columbia-area assisted living communities must adhere to the comprehensive set of state laws and regulations that all assisted living communities in Maryland are required to follow. Visit our Assisted Living in Maryland page for more information about these laws.